Every once in a while the guys at Quickspin come up with a new online video slot, and it is an absolute winner every time. Quickspin has been on a streak recently as they have managed to publish many new slots which became instantly popular among online slot enthusiasts. 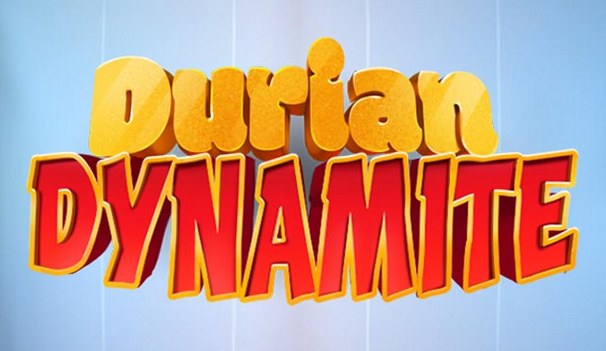 One of their most recent online games is called Durian Dynamite, and it is the first 3D-rendered slot ever published by Quckspin. What does 3D-rendered mean? Well, if you are not knowledgeable in computer graphics, all you need to know is that the game looks awesome and that all animations are very smooth and captivating. However, despite its magnificent and captivating looks, the slot’s best feature is its gameplay, which is filled with exciting bonuses such as exploding wilds and free spins bonuses. According to the Quickspin team, what players can expect from this game is a classic fruit game but set in a completely modern package. The game is loosely based on the Tales of Dr Dolittle which is a series of novels written by a famous author from the UK Hugh Lofting. There is a good reason why this slot is named Durian Dynamite since the durian is a type of fruit that belongs to the Durio species of fruits. In fact, many people call it “king of fruits,” as it can grow quite large. Durian is quite a controversial fruit since it has a very specific taste and odor that many people consider ‘the stinkiest fruit in the world.’ However, some people simply love how it tastes and smells. All things considered, it is a type of fruit that will not leave you indifferent, which is why it was so inspirational for the Quickspin team which decided to devote an entire online slot game to it. Therefore, if you really want to get rewarded by playing this slot, you need to get as many durians as possible since they are wilds which substitute all other symbols on the reels. However, the game also has other interesting bonus features, one of them being exploding wilds. The middle reel will discharge a lot of durians which will explode and multiply, thus bringing you more ways to create big wins. Finally, the game has an interactive side-game called Bonus Picker where the players get to pick random upgrades before the bonus game begins. Some of these upgrades include extra free spins, more wilds, more ammunition, and more active reels. If you happen to be among the minority that loves durian, this would be one tasty game for you! On the other hand, if you don’t feel like trying the stinkiest fruit in the world, then just let it appear on the reels and bring you hefty rewards. All in all, this is one strange yet enjoyable game filled with vivid colors and lucrative bonuses that every online slot enthusiast should try!